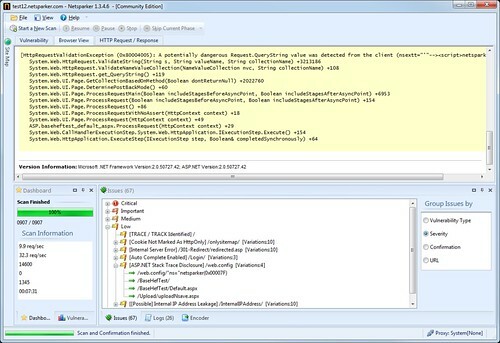 Netsparker is a Web Application Security Scanner that claims to be False-Positive Free. The developers thought that if you need to investigate every single identified issue manually what’s the point of having an automated scanner? So they developed a new technology which can confirm vulnerabilities on demand which allowed us to develop the first false positive free web application security scanner. You don’t need to be a security expert, get training or read a long manual to start. Since the user interface is easy to use and can confirm and show you the impact, you can just fire it up and start using it. We’ve tested several scanners which claim to be “false positive” free. It would be great if someone could make an independent test of our result. We made a testpage with a rewrite condition and we were stunned about the bad handling of false positives by the web security scanners. Thanks for pointing out this problem. Netsparker already has a URL Rewrite detection engine and it works on file extensions as well. However this particular case happens due to a bug. We fixed this problem in 1.3.7.32, will release it soon.